In the writings of the Holy Fathers, especially the ancient Fathers, we are given as examples to be emulated the many stories of absolute and unquestioning obedience of novices to their spiritual fathers. We are told stories of holy men who submitted unquestioningly and with profound humility to spiritual fathers and who themselves became saints because of that humble submission. We are told of clairvoyant elders, full of love for their spiritual children, who unerringly guided their spiritual children on the path to godlikeness, and we are told of spiritual children suffering harsh consequences as a result of disobeying their spiritual mentors. This tradition of discipleship under a wise and experienced spiritual guide (father or mother as the case may be) is an essential part of our Orthodox Christian tradition and a necessary aspect of our growth and transformation into godliness. However, this way of spiritual fatherhood is much misunderstood these days and consequently–even if unintentionally–sometimes results in unhealthy relationships and even spiritual abuse. In such cases, instead of helping one grow in Christ, a inappropriate or misunderstood relationship with someone whom you consider to be a spiritual father or mother (or with someone who presents themselves as a spiritual father or mother) can result in prolonged spiritual infancy, years of confusion or anger, and even in one turning away from Christ completely. The fruit of this misunderstood or misapplied teaching about spiritual fatherhood began to be most clearly seen for the first time in eighteenth and nineteenth century Russia. And it was in response to the abuse and suffering that he both experienced and saw that St. Ignatius Bianchaniov published in St. Petersburg in 1867 his Offering to Contemporary Monasticism. The English translation of this text, first published in 1970, is called The Arena: Guidelines for Spiritual and Monastic Life. It has been reprinted several times in English, the latest being 2012 by Holy Trinity Publications. Anyone who is serious about finding a spiritual father or mother must—and I really mean must—read this book. What I am about to say about finding a spiritual father or mother has been influenced largely by this book, although I do not follow his exact presentation. Some of what I am about to say is also influenced by my own experience and the wisdom I have picked up here and there from people much smarter than I. First, when we are seeking a spiritual father or mother, we must realize that we live in a very different world from the world that produced the holy Fathers and Mothers we read about in the ancient spiritual writings of our Church. St. Ignatius goes so far as to say (and I’m paraphrasing here) that there are no spiritual fathers any more—at least not like those that we read of in, for example, the Ladder of Divine Ascent or the Sayings of the Desert Fathers or the Rule of St. Benedict. I don’t know if I can agree completely with St. Ignatius here. There may indeed be one or two or three holy men or women hidden throughout the world—men and women who shine with the Divine Energies of God, who pray without ceasing and who are permeated by the love of God. I still believe (or at leas hope) that there are a few such very holy people in the world today. However, that is just the point in this paragraph: if there are any such very holy men or women worthy of complete obedience, if there are any in the world today, they are very few and they are hidden, devoting their life to prayer. The reality is that this indeed would cure your problem with gossip, but unless you are yourself called to the eremitical life (the life of a hermit), it is a medicine much too strong for you. And if you tried to follow this advice as a person not called to the eremitical life, you would indeed experience a great deal of spiritual harm. But what other advice could this holy hermit give you? It is indeed the pathway that he or she has found to salvation. It is what he or she knows works. And it is the perfect advice for someone who is called to be a hermit. And this we often forget when we read the Philokalia or some other holy writings of our Church. These were written mostly by monks for monks or sometimes even by hermits for hermits. Sure there is much people in the world can learn from these writings, but great humility and discernment is needed. Advice designed for monks living in the desert of Scetes (for example) in fifth century Egypt has to be adjusted and modified to apply in a healthy way to someone living in the world today. It is just like medicine. The same dose of medicine that would cure a 200 pound healthy adult might kill a infant. We must be very aware of our immature and weakened spiritual state and the calling of our lives in the world when we seek to apply spiritual medicine that has been prescribed for mature spiritual men and women called to monastic life. And this is the second problem we run into when we are looking for a spiritual father or mother: We tend to have a much too high view of ourselves and of our needs as spiritual children. 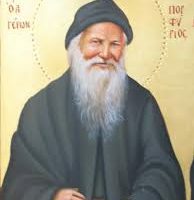 This pride (or in the best case scenario, just plain ignorance) leads us to think that we need someone like St. Seraphim of Sarov or St. Herman of Alaska or (from the lofty heights of my own imaginings at one time) St. Pacomius the Great or his holy disciple St. Theodore to be our spiritual father. We wrongly think that only such a holy person could ever guide us on the path to Christlikeness. But the reality is that if we cannot be guided by people God has already put in our life, then we are fooling ourselves to think that a more holy spiritual father or mother would make all of the difference for us. Remember, Jesus did say, “he who is faithful in little will be found faithful in much.” If we can’t be faithful in the little spiritual guidance God has already put in our life, how can we expect not to be singed by the white-hot holiness of a truly holy saint? Humility is called for: humility and discernment. And this I think is the third matter that has to be addressed in looking for a spiritual father or mother: humble discernment. My bishop once wisely said that it is the responsibility of each of us to listen carefully and respectfully to those God has placed in our lives as teachers, priests, parents and mentors. However, it is also our responsibility to separate, or discern, what is useful to us in what they say and in the example of their life, keeping and emulating those things which we find helpful; and then, to politely ignore the rest. Our problem, or at least my problem, is that what I think I want is a relationship with a spiritual father or mother that is fool proof, infallible, that does not require any engagement on my part other than mere mechanical obedience. But such a relationships does not exist: at least not as a life-giving relationship between a spiritual father and son. Such a mechanical relationship can lead to nothing but death. We are not machines. The element missing in our misconceived understanding of a longed-for relationship with a very holy spiritual father or mother is love. The reason why absolute obedience was possible and healthy among the holy Fathers we read about is that they loved absolutely. In addition to holiness and humility, love permeated every aspect of the relationship of the spiritual father with his son. And in the rare cases when the spiritual father was deranged, it was the holiness, humility and love of the spiritual son that drew the Grace of God to that relationship. Holiness, humility and love: that’s what makes all of the difference. But the problem is that I am not very holy, humble or loving; and that’s the reason why I have to start small. We all have to start where we are and with those God has already put in our life. If we can humble ourselves and listen for what is life-giving and helpful in the advice given by those already in our lives, we might come to be able to hear what is life-giving from those God may bring into our lives in the future. I am a big believer in pilgrimages and monastery visits. I think everyone should have a monastery that they consider their own, a place they visit often and support financially and pray for daily. And who knows, maybe in such a monastery one might even find a spiritual father or mother who can effectively guide them in the spiritual life. However, one thing is certain: if you cannot already submit to and gain good advice and help from the people God has already put in your life—sorting out what is life-giving for you and politely ignoring what isn’t—then you will certainly not find good spiritual guidance in a monastery or even on the Holy Mountain or even from a genuine God-bearing elder (were you to find one). You will not find good spiritual advice not because it is not there, but because you have not trained yourself to hear it. You have not begun by hearing the small wisdom God has given to those who are already in your life so that you can slowly grown to hear wisdom from those who are more spiritually advanced. I have personally known several people who have gone for confession and spiritual counsel to people who have the reputation of being spiritual elders. Some have come back from this experience helped, encouraged and strengthened. Others, going to the very same spiritual fathers, have had their lives torn apart and spent years in confusion and frustration. This matter of spiritual fatherhood is a very dangerous business. You know, we all want a short cut, a failsafe way to heaven. And I think many of us have imagined that finding a truly holy spiritual father or mother would provide that way. But there are no short cuts in the spiritual life. We all, each of us, must humble ourselves and both submit to others and take responsibility for our own life. It is the tension, or better the breathing of our spiritual life: inhale, exhale; inhale, exhale; inhale (submit humbly), exhale (discern humbly); inhale (submit humbly), exhale (discern humbly). This is the spiritual life. Only to inhale or only to exhale is death. But to grow in Christ, we must breathe. Thank you for this post, Fr Michael. I read The Arena several months ago and it really changed my life. My priest in my spiritual father, and while he's not perfect (who is? ), he is a good spiritual father. It has taught me to let go of my pride, as you mentioned, in thinking that I need/deserve a guide who is a saint. I'm an infant on this journey anyway, and like you have mentioned, I am learning to be content and grow under the people whom God has placed in my life. Thank you for the article, it was very helpful. While i can see wisdom in the advice of using discernment in accepting or rejecting the guidance of a spiritual father, where do we find any assurance that doing one or the other is better? We don't. Assurance is a spiritual matter. We can never be completely certain about our actions—we are all fallible, even when we try hard not to be. In the end, we must trust God and humbly accept and learn from our mistakes—but we can never be certain we are not making a mistake. We can only trust in God, humble ourselves, admit mistakes when we see that we have made them and do our best to learn from them. I’m really confused about this whole spiritual fatherhood. I keep seeing this same Bishop in my dreams. Can he really by my spiritual father? ?? Seeing someone in your dreams, even a holy person, does not mean he is your spiritual father. Spiritual fatherhood is a relationship that sometimes takes years to develop. Dreams are mysterious and interpretation of dreams is even more mysterious. Usually one knows only bits and pieces. As we live our life a dream may help us turn a certain direction or knock on a particular door, but it is very foolish to assume you know what is going to happen. For example, perhaps this bishop you dream of will introduce you to someone significant, or perhaps you dream of this bishop because he needs your prayers. It’s possible that your relationship with this bishop could become confessional and blossom into spiritual fatherhood, but you won’t know until it actually happens. 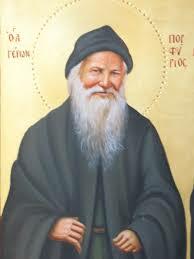 Forgive me, but the picture you used is of Saint Paisios, not Saint Porphyrios! Thank you for pointing that out! I have changed the picture.